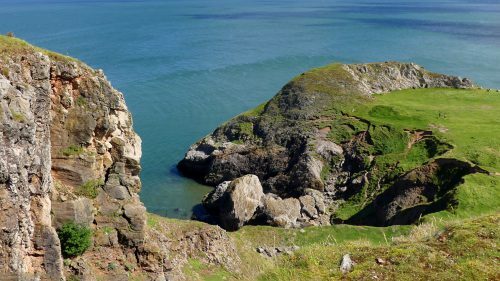 I contacted someone from the Conwy Valley Branch of the NWWT recently to find out if Angel Bay was part of their Rhiwledyn reserve but it isn’t. It seems that it is probably part of Mostyn estates land, for which there is permissive access. I am also told that no seals are actually born there, but brought in later. 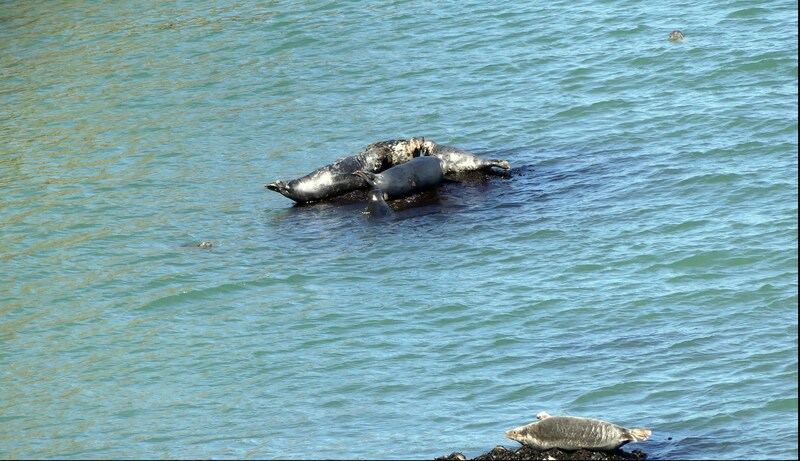 And as regards to disturbance, the seals seem remarkably tolerant of people and that dogs would worry them more. It’s a shame when the boats go too close, pregnant ladies deserve some peace! Thanks for the photos and entertaining narration. Thank you Emily, I agree the seals deserve their peace and a bit of privacy at such a time. 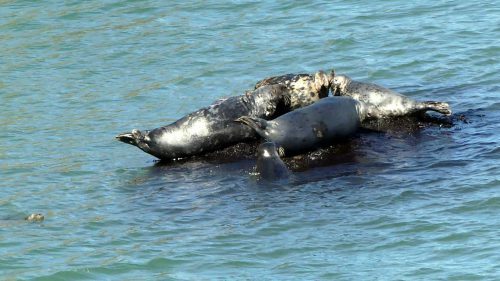 I think the boat-trip organisers were excited to be able to show people close-ups of the seals, clearly good for business, but seizing an opportunity some managed it more considerately than others. Wondering if Angel Bay could be fenced of to stop people going down there especially when the seals are giving birth and when there are pups on the beach. Hi Suzanne, I’m always surprised it hasn’t been fenced already to save people from themselves – I’ve watched people scrambling down there and a couple of times seen children stuck on the rocks on the way back up. 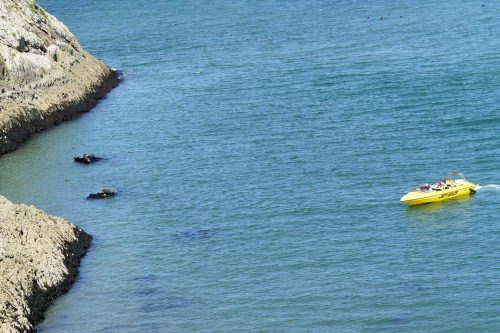 I can say I myself have never seen anyone go down there when there are seals on the beach, but I’d not seen sightseeing boats before either – that worried me more. I used to go down to this cove with my family when I was young (before the estate was built so you can tell how long ago that was) and I don’t ever remember seeing seals there before. I was wondering how long they have been coming to Angel Bay. 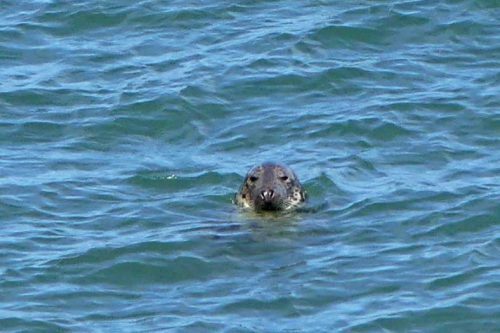 Judging by the size of one of the seals in your photo it doesn’t look as if she has long to go before she gives birth. I have seen pups in white coats at Angel Bay and didn’t think they could swim at that stage so I’m wondering if perhaps they could have been born there? If so it is worrying to think there might still be people down on the beach at the time. 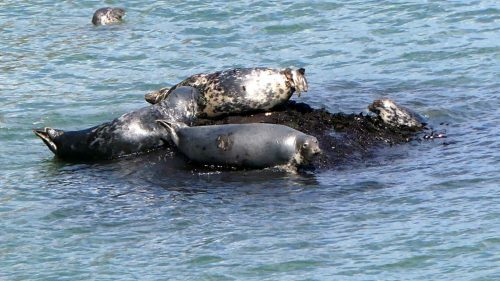 That’s interesting- I didn’t think there was enough dry land left in the bay once the tide came in for seals to give birth & spend the three weeks needed by the pups there- it would be lovely if they do. I must get back for another look. I too hope that people have the sense to stay away from them. 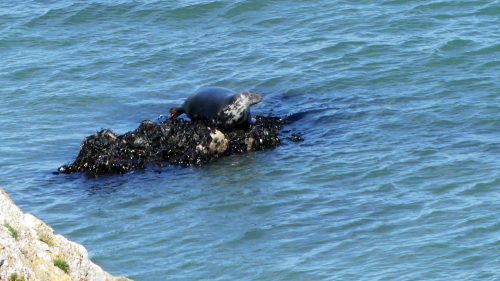 I’ve been wondering how long the seals have been using the beach too – my son-in-law grew up in Penrhyn Bay & says he remembers them being there when he was young, he’s 32 now, but don’t know how far his memory goes back! Fascinating post. Being from Ohio, I only see seals when I’m on the west coast of California or Mexico. I usually see them near peers and not really in their natural habitat like you show above. 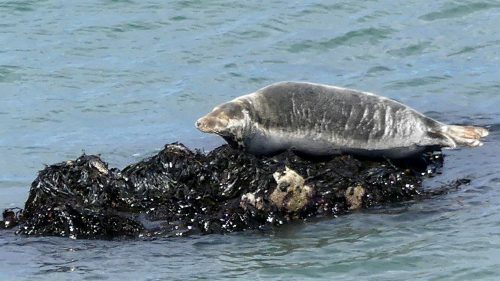 Didn’t realize that Grey Seals only have one pup, suckle them for a short time, and then mate again within a month of giving birth. I love seeing Wales through your eyes. Such beauty. My visit 19 years ago took me to crop circle, churches and sacred sites. There is so much more beauty to see — my mother’s ancestors came from Wales. Thank you Patricia, seals are fascinating aren’t they? I’m not sure why as when I see them here they don’t usually do much more than sleep on the beach, but I and many others watch them do that for ages. Perhaps it’s meditative for us to watch animals at peace! Although the poor females don’t get much of a break. I hope I can keep bringing you glimpses of the wild beauty of your ancestral home. That last seal looks enormous. I hope this means we’ll get to see pup photos soon, or don’t they give birth at this spot? I know, poor thing. I don’t know how she managed to get onto that little bit of rock! Angel Bay has apparently long been a favoured haul-out site for the seals, but its beach is only exposed at low tide. I don’t know where they go to give birth & spend time with newborns. 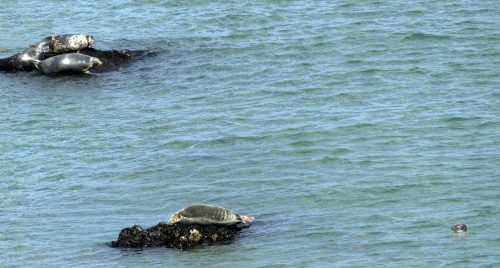 It must be nearby as I have seen them here with very young ones that are able to swim and a few years ago posted about the rescue of a newborn that had got itself stuck under the rip-rap on Rhos Point. Would love to see baby ones myself, will keep looking! (I know some have already been born on Skomer Island). Probably best they’re hidden away somewhere, not from you but from those boat tours. Yes, I’ve been following the Skomer arrivals on Facebook. Just gorgeous! I agree they are far better off somewhere less visible and accessible.The Skomer pups are just beautiful.